I am not sure if many of you are aware, but there are FREE tours of Gracie Mansion, the residence of New York City’s mayors for 75 years. Fascinating glimpse into the personal and political lives of the mayoral families, as well as a fine example of Federal style architecture, furniture, and history. There is a great piece on Revolutionary War history and the tie ins with Alexander Hamilton! You can read about the history of Gracie Mansion on their website, and order tickets as well HERE. The tour times are as follows: 10:00am, 11:00am, 2:00pm, and 3:00pm on Tuesdays only. If you do not see a slot available in the drop-down menu it means that it is fully booked. Please register for an alternate time. The tours start on time; please arrive five (5) minutes prior your scheduled tour time with a form of government issued Photo ID. NYPD reserves the right to deny access to guests without Photo ID. Anyone arriving ten (10) minutes or more after the designated hour will not be allowed in, but may wait for the next tour that day. No photography or filming is permitted in Gracie Mansion. Spaces are extremely limited. Reservations will be granted on a first come, first serve basis. 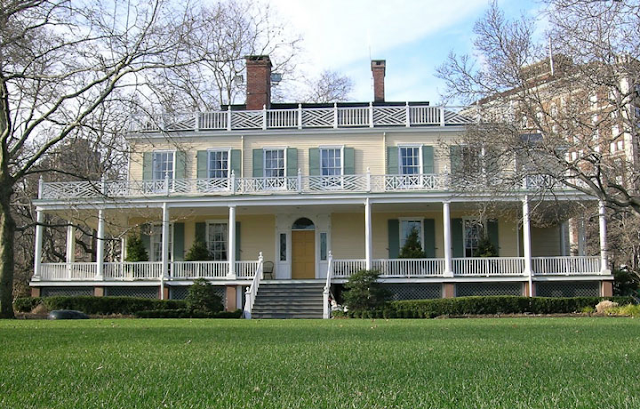 We ask that you please honor your reservation as there is a waitlist to tour Gracie Mansion. In case of an emergency and you cannot attend, please let us know directly by emailing gracieinfo@cityhall.nyc.gov. Reservations are non-transferable. This is really a wonderful opportunity if you are looking for something different to do in the city, and have a fondness for history and architecture.